Battle ready Cutlass and Pirate Swords for reenactors, historians and collectors who wish to own authentically forged sword blades. 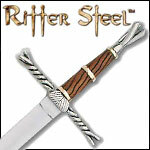 Stage Steel Rapiers are durable swords for practice, theatrical, sparring and reenactment. Perfect for the stage professional and re-enactors as their aged appearance is designed to replicate a true real life renaissance weapon.